Interested In Facilitating Our Programs? Our self-paced facilitator training programs, consisting of recordings, visual aids, printed materials, and personal mentoring will prepare you to lead your own seminars using our materials. You will receive a solid grounding in all the key concepts of the programs, covering meaning, application, and presentation. Once you have completed the facilitator training for a particular program, you become a Licensed Facilitator. You can purchase materials for that program and present your own workshops. We supply all the materials you need to deliver the courses, for a per-participant fee. Our process is not for everyone. The facilitator training has been designed for individuals with an existing competence in group facilitation. 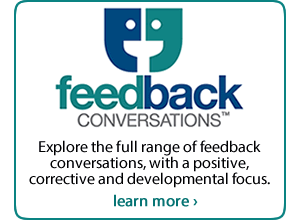 The trainings for Navigational Conversations and Feedback Conversations assume some basic understanding of coaching, particularly coaching in the workplace. The primary focus of the facilitator training is on understanding the key concepts of the material, rather than on facilitation skills, although we do explore specific tips and strategies for facilitating the material. A) You work within an organization and must select and deliver high quality leadership development programs to your management team. You or other trainers in your organization need to learn new programs quickly and be ready to deliver them. Your trainers are dispersed geographically and need a format that is accessible to everyone and that allows individuals to learn at their own pace on their own schedule. B) You are an independent consultant and you want to strengthen your program offerings. Rather than invest the enormous amount of time needed to develop new material, you would rather spend your available time marketing and delivering training. You need to add new offerings to your portfolio. You want those new offerings to be top-notch. Here are some problems this training can solve for you. 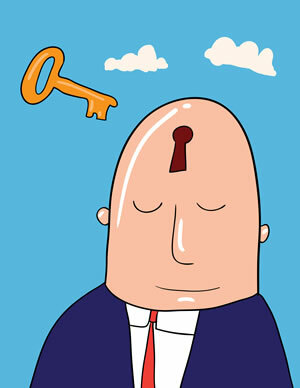 Your facilitation business needs a “turnkey” way to provide a new revenue stream. You want something that has already been proven in the marketplace. You don’t want to start from scratch to create a workshop. Years of expertise must be built into the materials and methodology. You expect workshop materials that deliver on the promises you make to your clients. You don’t want to design, produce and test the materials. Your client companies are asking you for training in leadership development. You already have a base of satisfied clients, but lately they’ve been asking you for training you don’t have in your repertoire. You’re researching training products that you might deliver. You want a top quality workshop that garners you rave reviews and repeat engagements. You see a need in the market and want to fill it. You want the fastest, simplest, easiest way to provide leadership development for your clients. As you speak with current workshop participants, you notice a trend in what they are asking for. 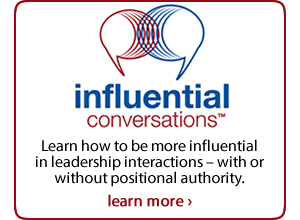 They talk about the challenging leadership conversations they need help with. You don’t have the training materials to fill their needs. Your facilitation business has an immediate way to generate new revenue. You offer a workshop that has already been proven in the marketplace. You haven’t had to spend your time writing, testing and producing the materials. You clearly recognize the years of expertise built into the materials and methodology. You feel utterly confident that the workshop materials deliver on the promises you make to your clients. Your client organizations are getting the leadership training they’ve been asking for. Your satisfied clients are pleased at your ability to handle their needs. They’re delighted that you were able to satisfy them so quickly. You’re completely sure that you are delivering top quality workshops and materials. Participants give rave reviews, and you get frequent requests for repeat engagements. You are able to fill the needs you see in the market. Prospective clients notice your program offerings and ask about them. When they talk about the challenging leadership conversations they need help with, you have solutions to offer. You have the training materials to answer their needs. You have the fastest, simplest, easiest ways to bring essential skills to organizational leaders. We currently offer two ways to learn how to facilitate our Navigational Conversations Workshop: self-paced training and in-house training. You may want further information concerning the Navigational Conversations workshop itself. For full details on that workshop, go to Navigational Conversations: Program Objectives. To discover how adding Navigational Conversations to your offerings can enhance your business, read about successful facilitators already leading our workshops. Click here to learn about our self-paced training program. You may want further information concerning the Influential Conversations workshop itself. For full details on that workshop, go to Influential Conversations: Program Objectives. Mirella De Civita, Ph.D., ACC -- President, Papillon MDC Inc. I began the training with high expectations, and an incredible sense of urgency to immerse myself in the material. I completed the program with all of my expectations met, and surpassed. This training workshop was like no other I have experienced in the area of coaching. The content is rich with intimate knowledge of what it takes for managers to shift from being a problem-solver to being a mindful leader who coaches people to levels of greatness. The depth of experience of both Cheryl and Brent comes through every module. 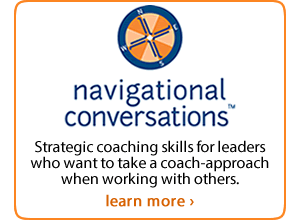 The Navigational Coaching program has added incredible value to my clients. And, I feel privileged to be able to introduce this program to them!